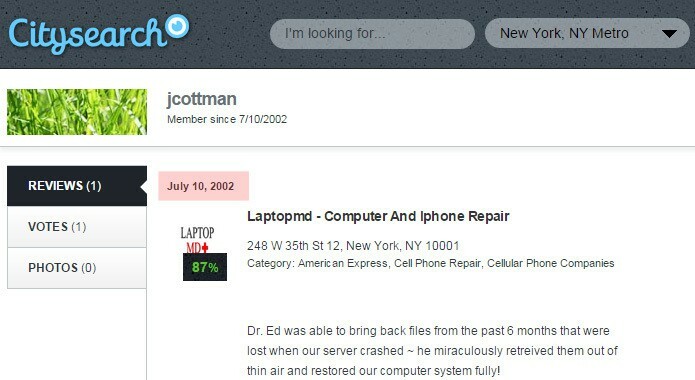 When LaptopMD started in 1999, we were the first computer service in Manhattan of our kind. Since then, many copycats have sprouted “borrowing” our theme, calling themselves “doctor” this, “hospital” that. We promise it’s real, but if you want to search for yourself visit our City Search page and click “more reviews” until you get to that very first review from 2002. Our reviews even predate Yelp, which started in 2004. How many of the services that claim to have been around since 2002 have reviews that go back that far? How many have won “best of City Search” (tying with the Apple store) like us? How many have earned press in CNN, CBS and the Wall Street Journal like us? None. You can’t find a single service with a medic theme until after us. We are the original medics, but still unparalleled. The proof is all over. We’re a BBB accredited service. We have a 10 million dollar insurance policy with a respected firm. We even have a live cam so you can view our experienced engineers service devices. At LaptopMD, nothing is hidden from our clients; in fact we encourage you to look us up all over the net!